The gist: When you give to charity this year, be sure to follow these steps to get a tax break come April. Your donations don’t just help the receiving charity; they bring you numerous benefits as well. Aside from the simple pleasure of knowing you’re helping something bigger than yourself, you also receive a deduction from the IRS on this year’s taxes. But, of course, you have to document your donations carefully, and make sure to follow their guidelines. And fill out their forms. And stay under their limits. Here are NerdWallet’s tips on getting on the IRS’s good side, as well as karma’s. The IRS only allows you to deduct donations to a set list of organizations, viewable here. The list includes 501(c)(3) organizations, which are considered public charities. 501(c)(4) organizations can spend a good portion of their revenue on lobbying, and not all donations are tax-deductible. As far as the tax man is concerned, time isn’t money: you can’t claim a deduction for time spent volunteering. If you can’t prove it, don’t deduct it. The IRS requires a bank record, payroll deduction record, or written acknowledgement from the charity; non-cash contributions of $500 or more require that you fill out Form 8283. If you donate an item or group of similar items valued at $5,000 or more, you generally must have the item(s) appraised. Donor-advised funds are gaining in popularity, and can offer some advantages as compared to private funds. These advantages include: ease in calculating your deductions, less strict limits on how much of your income you can deduct, and privacy – private funds are required to disclose their tax forms, which can include donor information, while donor-advised funds allow for anonymous giving. They can also save you from the hassle, paperwork and disbursement restrictions on a private fund. Some examples include the Fidelity, Schwab and Vanguard charitable programs. The lowest deduction limit is 20% of your adjusted gross income, so if you’re deducting less than that, you don’t need to worry. The IRS’s limits are byzantine at best, but here’s a brief summary. Churches; educational organizations; hospitals; states, the government or Indian tribes; philanthropically oriented, publicly owned corporations, trusts, funds and foundations; and a few others. If you donated your capital gain property, you can claim a deduction on up to 30% of your income. 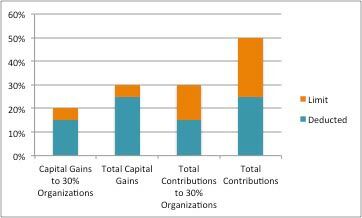 Your donations to all other qualifying organizations that aren’t 50% organizations are capped at 30%. These include donations to veterans’ organizations, fraternities, and nonprofit cemeteries. Your capital gain property deductions to 30% organizations are capped at 20% of your AGI. Okay, that was confusing. But there is a clear hierarchy, though of course there are thousands of loopholes and exclusions. A good way to think of it is to put your deductions into buckets. Imagine you have four buckets, which only hold the amount you can deduct. First, let’s say that your donation is 15% of your AGI. This goes into all four buckets, since it counts towards all four limits. Now, you pour your capital gains contribution to 50% organizations. This only goes into Bucket 2 and 4, since the limits to 30% organizations don’t apply. Let’s say that you donated 10% of your AGI. Now, you pour your non-capital gains contributions to 30% organizations into Buckets 3 and 4. The capital gains limits don’t apply, but the total 30% organization limit does. Let’s say that this makes up 20% of your AGI. Note that you can only deduct 15% of your AGI, since your capital gains donation of 15% of your AGI applies to the overall 30% organization limit as well. Finally, let’s say that your non-capital gains to 50% organizations adds up to 5% of your AGI. You add that in to the last bucket. It turns out that you can deduct donations up to 45% of your AGI, because even though you cumulatively donated 50% of your AGI, you donated 35% of your income to 30% organizations, which put you over the limit there. Sound daunting? It shouldn’t be. Just remember that you aren’t donating so that you can get a tax deduction. If you’re feeling cynical, you’re donating because there are anthropological reasons to give gifts which include cementing your dominant position in society. But if you’re in the holiday spirit, you’re giving because it’s the right thing to do.